Las enfermedades cutáneas desencadenadas por medicamentos son comunes y, en su mayoría, no fatales; sin embargo, algunas de ellas menos frecuentes, son potencialmente mortales. Se destaca el espectro del síndrome de Stevens-Johnson/ necrólisis epidérmica tóxica y el síndrome de hipersensibilidad a medicamentos con eosinofilia y síntomas sistémicos. Al ser enfermedades de baja incidencia, es común que el personal de cuidados intensivos no esté familiarizado con su presentación, diagnóstico y tratamiento, lo que puede asociarse con demoras en la atención adecuada y con impacto en la morbimortalidad. En esta revisión narrativa se abordan estas entidades clínicas y se describe su asociación con medicamentos de uso frecuente en las unidades de cuidados intensivos; además, se tratan la fisiopatología, la presentación clínica y el tratamiento. Cutaneous diseases triggered by medications are common and usually harmless, but some of the less frequent variations can be life threatening. Some of the diseases in this category are the spectrum of Stevens-Johnson syndrome/ toxic epidermal necrolysis and drug reaction with eosinophilia and systemic symptoms syndrome. The rare occurrence of these diseases has led to low levels of knowledge on its clinical presentation, diagnosis and treatment by medical staff on intensive care units, which can be associated with attention delays and negative impact on morbimortality. This article reviews the above conditions, and describes its association with medications frequently used on intensive care units, as well as its pathophysiology, clinical presentation and treatment. 1. Roujeau J. Clinical heterogeneity of drug hypersensitivity. Toxicology. 2005;209:123-9. 2. Steven A, Johnson F. A new eruptive fever associated with stomatitis and ophthalmia. Am J Dis Child. 1922;(Case 2). 3. Bohigian GM. The history of Stevens-Johnson Syndrome and a case study. Cent Hist Med Washingt Univ Sch Med St Louis [Internet]. 2015; Available from: http://digitalcommons.wustl.edu/historyofmedicine_presentations/1. 4. Lyell A. Toxic epidermal necrolysis: An eruption resembling scalding of the skin. Br J Dermatol. 1956;68:355-61. 5. Sun J, Liu J, Gong QL, Ding GZ, Ma LW, Zhang LC, et al. Stevens-Johnson Syndrome and toxic epidermal necrolysis: A multi-aspect comparative 7-year study from the People’s Republic of China. Drug Des Devel Ther. 2014;8:2539-47. 6. Harr T, French LE. Severe cutaneous adverse reactions: Acute generalized exanthematous pustulosis, toxic epidermal necrolysis and Stevens-Johnson syndrome. Med Clin North Am. 2010;94:727-42. 7. Lin YF, Yang CH, Sindy H, Lin JY, Hui CYR, Tsai YC, et al. Severe cutaneous adverse reactions related to systemic antibiotics. Clin Infect Dis. 2014;58:1377-85. 8. Mahar PD, Wasiak J, Hii B, Cleland H, Watters DA, Gin D, et al. A systematic review of the management and outcome of toxic epidermal necrolysis treated in burns centres. Burns. 2014;40:1245-54. 9. Badia M, Serviá L, Casanova JM, Montserrat N, Vilanova J, Vicario E, et al. Classification of dermatological disorders in critical care patients: A prospective observational study. J Crit Care. 2013;28:220.e1-220.e8. 10. Peña-Hoyos ÁA. Enfermedades dermatológicas de pacientes hospitalizados en cuidados intensivos, Hospital de La Samaritana. Bogotá: Universidad Nacional de Colombia; 2016. 11. Victoria-Chaparro J. Eritema multiforme. In: Restrepo-Castaño A, Franco RS, editors. 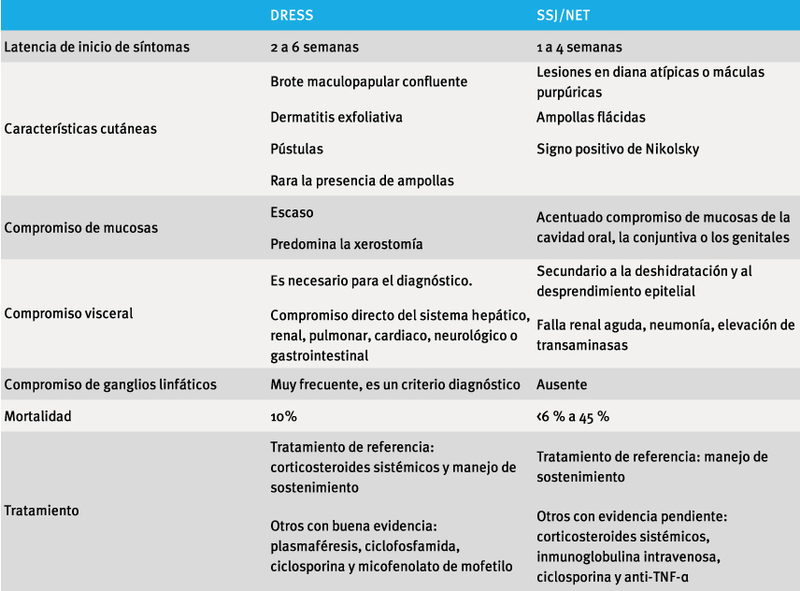 Dermatología. Octava edición. Medellín, Colombia: Corporación para Investigaciones Biológicas; 2017. p. 129-37. 12. Walicka M, Majsterek M, Rakowska A, Słowińska M, Sicińska J, Góralska B, et al. Mycoplasma pneumoniae-induced pneumonia with StevensJohnson syndrome of acute atypical course. Polish Arch Intern Med. 2008;118:449-53. 13. Domínguez-Borgua A, González I, Morales L, Martinez-Carrillo MF, Palacios P. Toxic epidermal necrolysis and development of liver abscesses. Gac Med Mex. 2015;151:512-8. 14. Uzun R, Yalcin AD, Celik B, Bulut T, Yalcin AN. Levofloxacin induced toxic epidermal necrolysis: Successful therapy with omalizumab (antiIgE) and pulse prednisolone. Am J Case Rep. 2016;17:666-71. 15. Yang CY, Dao RL, Lee TJ, Lu CW, Yang CH, Hung SI, et al. Severe cutaneous adverse reactions to antiepileptic drugs in Asians. Neurology. 2011;77:2025- 33. 16. Godhwani N, Bahna SL. Antiepilepsy drugs and the immune system. Ann Allergy Asthma Immunol. 2016;117:634-40. 17. Harr T, French LE. Toxic epidermal necrolysis and Stevens Johnson syndrome. Orphanet J Rare Dis. 2010;5:1-11. 18. Changela A, Javaiya H, Rickenback K, Elnawawi A, Changela K. Toxic epidermal necrolyis after vancomycin use: A case report and discussion of management. Am J Ther. 2013;20:223-5. 19. Harris V, Jackson C, Cooper A. Review of toxic epidermal necrolysis. Int J Mol Sci. 2016;17:1-11. 20. Lim VM, Do A, Berger TG, Nguyen AH, Deweese J, Malone JD, et al. A decade of burn unit experience with Stevens-Johnson syndrome/toxic epidermal necrolysis: Clinical pathological diagnosis and risk factor awareness. Burns. 2016;42:836-43. 21. Brickel N, Shaikh H, Kirkham A, Davies G, Chalker M, Yoshida P. Collaboration in pharmacovigilance: lamotrigine and fatal severe cutaneous adverse reactions – a review of spontaneous reports. Ther Clin Risk Manag. 2017;13:897-903. 22. Dodiuk-Gad RP, Chung WH, Valeyrie-Allanore L, Shear NH. Stevens-Johnson syndrome and toxic epidermal necrolysis: An update. Am J Clin Dermatol. 2015;16:475-93. 23. Galindo-Díaz LF, Díaz-Guío DA. Insuficiencia cutánea aguda. En: Díaz-Guío DA, editor. Cuarta edición. Armenia, Quindío: Publicaciones Vital Care Cuidado Crítico; 2013. p. 478-86. 24. Paradisi A, Abeni D, Bergamo F, Ricci F, Didona D, Didona B. Etanercept therapy for toxic epidermal necrolysis. J Am Acad Dermatol. 2014;71:278-83. 25. Yang LP, Zhang AL, Wang DD, Ke HX, Cheng Q, Wang C. Stevens-Johnson syndrome induced by the cross-reactivity between teicoplanin and vancomycin. J Clin Pharm Ther. 2014;39:442-5. 26. Arshad F, Bhat TS, Lone AR. Docetaxel induced Lyell’s syndrome: A rare life threatening cause of dermatitis medicamentosas. J Cancer Res Ther. 2014;10:742-4. 27. Creamer D, Walsh SA, Dziewulski P, Exton LS, Lee HY, Dart JKG, et al. UK guidelines for the management of Stevens-Johnson syndrome/toxic epidermal necrolysis in adults 2016. J Plast Reconstr Aesthetic Surg. 2016;69:e119-227. 28. Yamane Y, Matsukura S, Watanabe Y, Yamaguchi Y, Nakamura K, Kambara T, et al. Retrospective analysis of Stevens-Johnson syndrome and toxic epidermal necrolysis in 87 Japanese patients - Treatment and outcome. Allergol Int. 2016;65:74- 81. 29. De Prost N, Mekontso-Dessap A, Valeyrie-Allanore L, van Nhieu JT, Duong TA, Chosidow O, et al. Acute respiratory failure in patients with toxic epidermal necrolysis: Clinical features and factors associated with mechanical ventilation. Crit Care Med. 2014;42:118-28. 30. Bastuji-Garin S, Fouchard N, Bertocchi M, Roujeau JC, Revuz J, Wolkenstein P. Scorten: A severity-ofillness score for toxic epidermal necrolysis. J Invest Dermatol. 2000;115:149-53. 31. Seczynska B, Nowak I, Sega A, Kozka M, Wodkowski M, Szczeklik W. Supportive therapy for a patient with toxic epidermal necrolysis undergoing plasmapheresis. Crit Care Nurse. 2013;33:26- 38. 32. Schneider JA, Cohen PR. Stevens-Johnson syndrome and toxic epidermal necrolysis: A concise review with a comprehensive summary of therapeutic interventions emphasizing supportive measures. Adv Ther. 2017;34:1235-44. 33. World Health Organization. WHO’s cancer pain ladder for adults [Internet]; 2013. Fecha de consulta: 18 de febrero de 2018. Disponible en: http:// www.who.int/cancer/palliative/painladder/en/. 34. Sekula P, Dunant A, Mockenhaupt M, Naldi L, Bouwes Bavinck JN, Halevy S, et al. Comprehensive survival analysis of a cohort of patients with Stevens-Johnson syndrome and toxic epidermal necrolysis. J Invest Dermatol. 2013;133:1197204. 35. Wolf R, Davidovici B. Severe cutaneous adverse drug reactions: Who should treat, where and how? Facts and controversies. 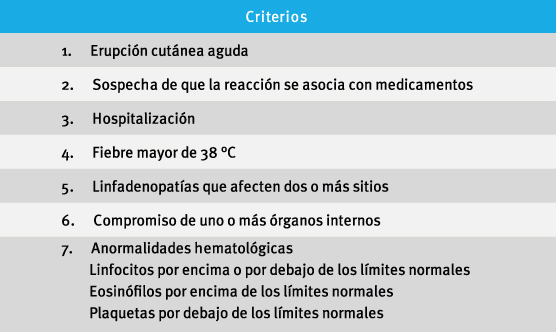 Clin Dermatol. 2010;28:344-8. 36. Paquet P, Piérard GE. New insights in toxic epidermal necrolysis ( Lyell’ syndrome). Drug Saf. 2010;33:189-212. 37. Saavedra C, Cárdenas P, Castellanos H, Contreras K, Castro JR. Cephazolin-induced toxic epidermal necrolysis treated with intravenous immunoglobulin and N-acetylcysteine. Case Reports Immunol. 2012;2012:1-4. 38. Husain Z, Reddy BY, Schwartz RA. DRESS syndrome: Part I. Clinical perspectives. J Am Acad Dermatol. 2013;68:693.e1-693.e14. 39. Shiohara T, Kano Y. Drug reaction with eosinophilia and systemic symptoms (DRESS): Incidence, pathogenesis and management. Expert Opin Drug Saf. 2017;16:139-47. 40. EL omairi N, Abourazzak S, Chaouki S, Atmani S, Hida M. Drug reaction with eosinophilia and systemic symptom (DRESS) induced by carbamazepine: Case report and literature review. PanAfrican Med J. 2014;8688:1-4. 41. Kimmoun A, Dubois E, Perez P, Barbaud A, Levy B. Shock state: An unrecognized and underestimated presentation of drug reaction with eosinophilia and systemic symptoms. Shock. 2013;40:387-91. 42. Chen YC, Cho YT, Chang CY, Chu CY. Drug reaction with eosinophilia and systemic symptoms: A drug-induced hypersensitivity syndrome with variable clinical features. Dermatologica Sin. 2013;31:196-204. 43. Błaszczyk B, Lasoń W, Czuczwar SJ. Antiepileptic drugs and adverse skin reactions: An update. Pharmacol Reports. 2015;67:426-34. 44. Sasidharanpillai S, Riyaz N, Rajan U, Binitha M, Khader A, Reena Mariyath O, et al. Drug reaction with eosinophilia and systemic symptoms: Observations from a tertiary care institution. Indian J Dermatol Venereol Leprol. 2014;80:221-8. 45. Ichai P, Laurent-Bellue A, Saliba F, Moreau D, Besch C, Francoz C, et al. Acute liver failure/injury related to drug reaction with eosinophilia and systemic symptoms: Outcomes and prognostic factors. Transplantation. 2017;101:1830-7. 46. Hamm RL. Drug-hypersensitivity syndrome: Diagnosis and treatment. J Am Coll Clin Wound Spec. 2011;3:77-81. 47. Spriet S, Banks TA. Drug reaction with eosinophilia and systemic symptoms syndrome. Allergy Asthma Proc. 2015;36:501-5. 48. Miyazu D, Kodama N, Yamashita D, Tanaka H, Inoue S, Imakyure O, et al. 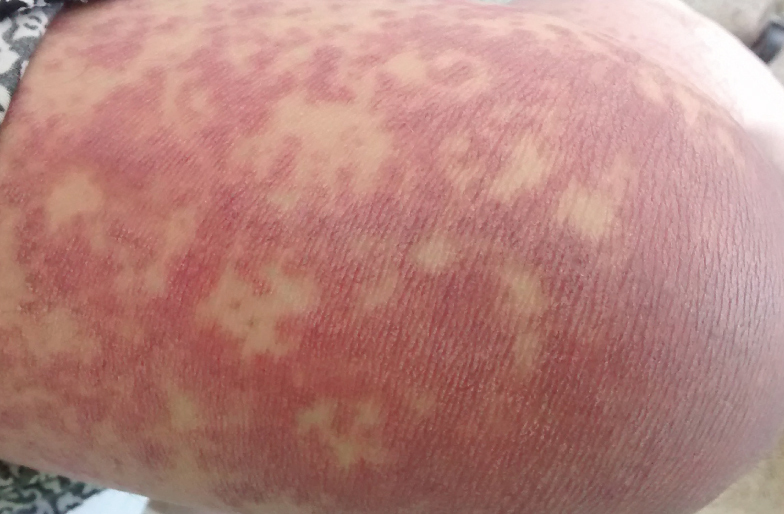 DRESS syndrome caused by cross-reactivity between vancomycin and subsequent teicoplanin administration: A case report. Am J Case Rep. 2016;17:625-31. 49. Nam YH, Park MR, Nam HJ, Lee SK, Kim KH, Roh MS, et al. Drug reaction with eosinophilia and systemic symptoms syndrome is not uncommon and shows better clinical outcome than generally recognised. Allergol Immunopathol (Madr). 2015;43:19-24. 50. Moriceau F, Prothet J, Blaise BJ, Ben Said B, Page M, Ber CE, et al. DRESS syndrome in the ICU: When a patient Is treated with multiple drugs. Case Reports Crit Care. 2016;2016:1-4. 51. Criado PR, Criado RFJ, Avancini J de M, Santi CG. A case of drug reaction with eosinophilia and systemic symptoms. An Bras Dermatol. 2012;87:435- 49. 52. Borok J, Hau J, Worswick S. Adult with morbilliform rash and tattoo bullae. Dermatol Online J. 2016;22:3-7. 53. Thongsri T, Chularojanamontri L, Pichler W j. Cardiac involvement in DRESS syndrome. Asian Pacific J Allergy Immunol. 2017;35:3-10. 54. Husain Z, Reddy BY, Schwartz RA. DRESS syndrome: Part II. Management and therapeutics. J Am Acad Dermatol. 2013;68:709.e1-709.e9. 55. Ocampo-Garza J, Ocampo-Garza SS, MartínezVillarreal JD, Barbosa-Moreno LE, Guerrero-González GA, Ocampo-Candiani J. Reacción por drogas con eosinofilia y síntomas sistémicos (síndrome de DRESS). Estudio retrospectivo de nueve casos. Rev Med Chil. 2015;143:577-83.